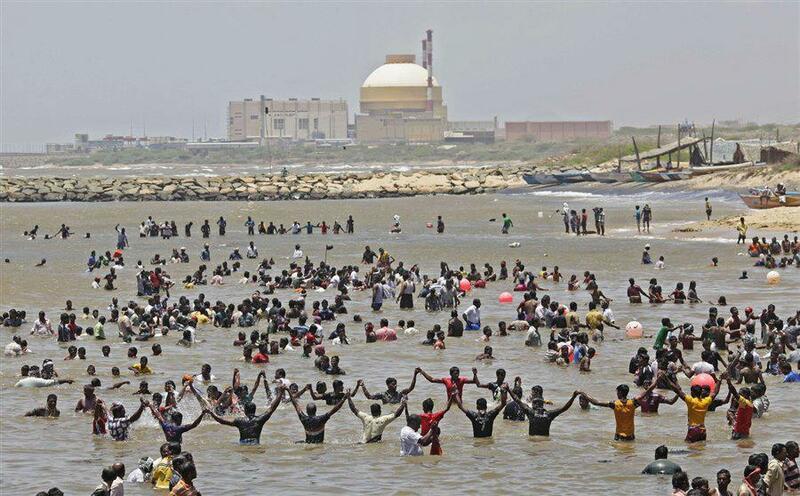 The Koodankulam Nuclear Power Plant is a nuclear power station in Koodankulam in the Tirunelveli district of Tamil Nadu. It is equipped with two 1000 MW reactors that are being built with Russian assistance, as is the plant. The government’s plans to add more reactors to increase the capacity of the plant have been met with vehement protests from the local population as well as some scientists and former civil servants. Similar protests have erupted against other nuclear plants as well, like the proposed Jaitapur Nuclear Plant to be built in collaboration with French energy giant Areva. These protests have gained ground and greater support after the Fukushima disaster in Japan, with protesters claiming that the Koodankulam plant is unsafe as it is in a seismic zone. One can understand the ongoing protests better if it is put in context and this can be done by embarking on a brief history of the plant. The story of this nuclear power plant begins in 1988 when the Rajiv Gandhi government entered into an Inter-governmental agreement with the Mikhail Gorbachev-led Soviet Union for construction of a nuclear power plant in India. Several factors, such as the political uncertainty surrounding the collapse of the Soviet Union and US opposition as the project did not comply with 1992 NSG guidelines, resulted in a decade-long stagnation. It was only in late 2000 that work on the project finally commenced. In 2004, a small port was built in Koodankulam which aided the construction of the plant. Till the port was constructed, all the equipment for the plant was transported by road from the Tuticorin port often resulting in delays and damage. With the Koodankulam port, oversized light water reactors could be brought to the plant from ships anchored at a distance of one and a half kilometre. The project got a boost in 2008 when negotiations between India and Russia resulted in Russia agreeing to build four more reactors for the Koodankulam plant. The restrictions imposed on India by the 45-nation Nuclear Suppliers Group were a major factor that stifled progress with the plant. These restrictions were lifted after intense negotiations accompanying the Indo-US Civil Nuclear Deal. This major development coupled with the Fukushima disaster provided the anti-nuclear power groups with enough ammunition to spark off protests and block the project. The plant has been in the news a lot over the past few weeks with experts opposing the project while other luminaries like Dr. Kalam throw their weight behind it. The government has been going back and forth on the issue while the Jayalalithaa-led State government voicing the concerns of the protestors with the Centre. However it is fallacious to assume that these protests are a knee-jerk reaction to the Fukushima disaster as local groups and activists have been opposing this project ever since its conceptualization. Ever since the 1980s one group called the People’s Movement Against Nuclear Energy has been opposing the project with the aim of shutting it down. They have also been educating the local population about nuclear energy. The leader of this organization is S.P. Udayakumar. The foundation of their opposition is the impact that the project is going to have on the pristine environment and the nearby coast. Their opposition has gained steam with time and has grown to include concerns surrounding disposal of the radioactive waste, safety mechanisms of the plant, impact of any possible seismic activity in the region and safeguards against a tsunami. From October 2011, protestors have surrounded the nuclear plant and prevented work on the plant from taking place. The protestors on the ground are mainly farmers, fishermen, social activists led by local organizations like the Tamil Nadu Fishermen Association. The protestors have blocked the main road leading to the plant for more than 100 days now, preventing the engineers and workers from entering the plant. Talks between the protestors and the government have taken place and broken down multiple times. The protests against the Koodankulam plant have also been boosted by support from an influential lobby of civil society members, former bureaucrats, scientists and NGOs. They have submitted a petition to the Supreme Court asking for the Civil Liability for Nuclear Damage Act, 2010 to be declared unconstitutional. They also want the Apex Court to ‘appoint an expert independent body to conduct a thorough safety reassessment of all existing and proposed nuclear facilities across the country’. They have submitted that the Court should declare that in the case of a nuclear accident, all nuclear operators and suppliers be jointly, severally and absolutely liable and their financial liability be unlimited. The government conducted several rounds of talks with the protestors all of which have resulted in either an impasse or complete breakdown. The government has been steadfast in its support for the project that is a Rs 13,000 crore investment. A number of people, including politicians, scientists and even the Former President Dr. Kalam have shown their support for the project. Dr. Kalam has repeatedly states that he believes that the Koodankulam Plant has all its safety measures in place and that “power-hungry” India needs clean forms of energy like nuclear energy. Protestors do not seem impressed by Dr. Kalam’s assurances and continue their agitation. The protests coupled with the PIL that has been filed in the Supreme Court make for a toxic combination that threatens to not only drive away any future investment in the nuclear sector in India but also the future of nuclear energy in India. India has nuclear deals with the USA, Russia, South Korea, Australia, Argentina, Britain, France, Canada, Kazakhstan, Mongolia, and Namibia. The nuclear power plants that are operational in India are Kaiga, Kakrapar, Kalpakkam, Narora, Rawatbhata and Tarapur nuclear power plants. They have twenty reactors put together. The nuclear power plants that are under construction in India are Koodankulam, Kalpakkam (1 reactor), Kakrapar (2 reactors), Rawatbhata (2 reactors) and Banswara. sir can you please tel me any book on legal aptitude.. Actuealy i’m preaparing for CLAT by myself and only with your guidelines.. i’m doing M K Panday for logics, Norman Lewis books for english and mathematics of R S Agrawal and also reading News Papers. but i’m not getting any thing rather any material on LA that could guide me to solve questions.. please suggest some books which are available in market.. i will be highly thankful to you guys..
my question is same as anshumans…my teacher tells me that past years papers on legal reasoning are the best for practice..but if there are any other books then pls suggest! For CLAT Aspirants: A reading on the Jaitapur issue would also help, it is also a hot discussion topic. Even the manufacturing of these reactors is running behind schedule and at over cost. There is a heavy defence quota in Army Institute of Law ,Mohali.